On Flights Manager users can find flight and hotel deals and make purchases. 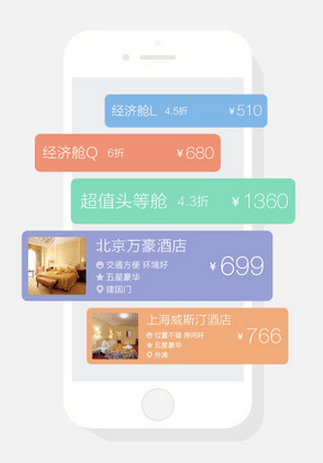 Huoli, the Chinese app developer behind Flights Manager and Bullet Train Manager (our translation), has disclosed a gross merchandise volume of RMB6 billion (around US$1bn) in 2014, up from RMB700 million (around US$113m) in the previous year. The company claimed it has had some 60 million users, with 5 million monthly active users as of March 2014 (source in Chinese). It raised two rounds of funding in 2011. Started with managing and tracking flight and train statuses in 2009, Huoli added purchasing capabilities to its apps in 2012. Apart from flight and train ticket sales, Huoli also makes money from third-party mobile games on in its apps, as well as hotel booking and car hauling services (eLong’s hotel service, Yongche’s airport pickup service and Kuaidi’s taxi booking service are currently featured). Huoli claims its mobile revenue in 2014 surpassed that of eLong, one of the China’s leading online travel agencies, as reported by Wang Guanxiong. This is not a like-to-like comparison, as the majority of eLong’s revenues come from hotel bookings, rather than sales of plane and train tickets, and eLong began on web rather than app. However, the new generation of online travel services are certainly now threatening the older Chinese online travel agencies such as eLong and Ctrip.